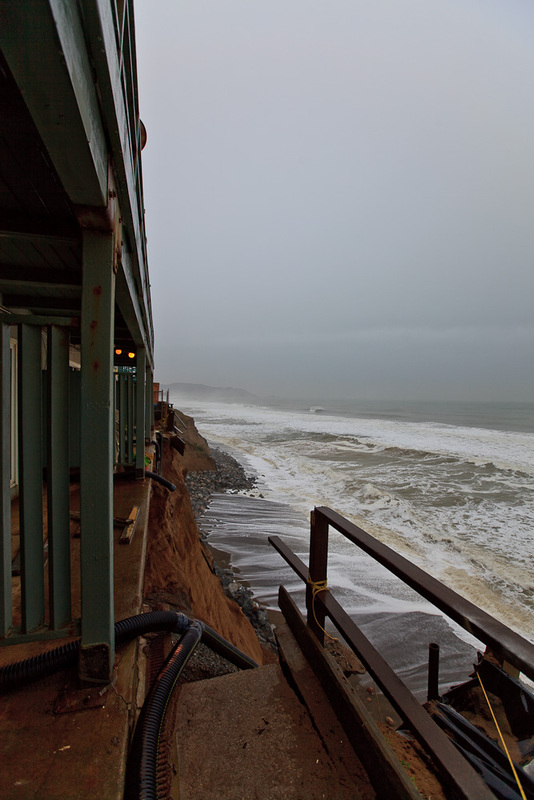 In a January 31 story from the San Francisco Examiner: Chances of saving Pacifica apartment building increasing Tony Fortunato said that his company’s next project will likely be to save and repair…a public access point down the road from the Esplanade Avenue apartments where pounding waves are also causing erosion. 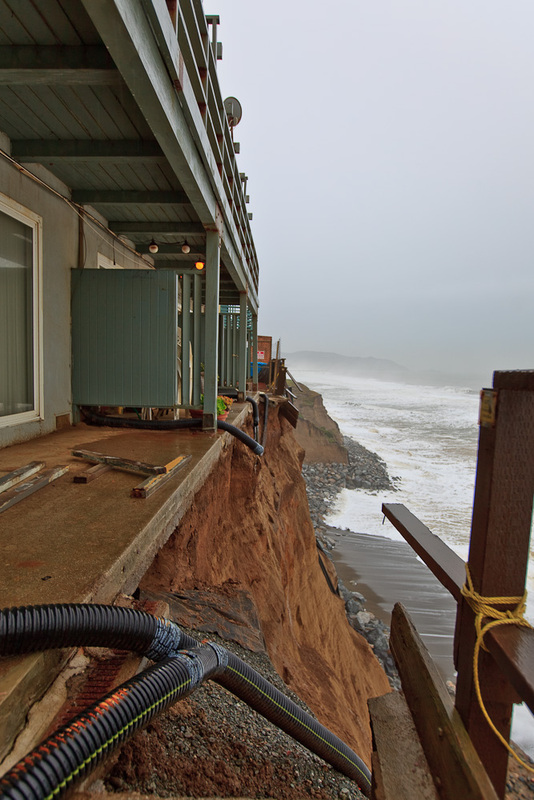 While the focus has largely been on the public access point, a grassy “dog park”, erosion has also cut into the bluff enough that residents of nearby Lands End apartments Building 112 are feeling threatened. 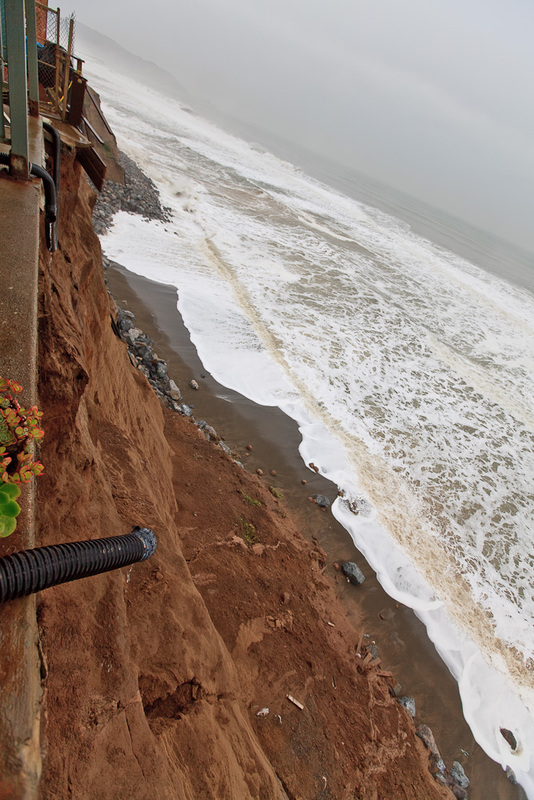 Before new work can begin the Coastal Commission will have to give its approval. It was my impression that the owners of Lands End may already have a permit application before the Coastal Commission for rock rip rap. Perhaps I was mistaken, or perhaps we’re still waiting for that approval. Time will tell. Crews continued to drill and cement 50′ rods into the bluff under 330 Esplanade. Work started at the top of the bluff in order to secure the most vulnerable part of the face first, and to make it safe enough to work lower down. As workers set each rod they cap it with a small square steel plate and spray a thin layer of cement onto the bluff all around it. At some point they will start construction of a full-height steel wall to provide more substantial support and protection to the bluff. The interior of the wall will be filled with cement, and the exterior will be coated with textured and colored cement made to resemble rock. The result should resemble the retaining walls along Route 92, etc. 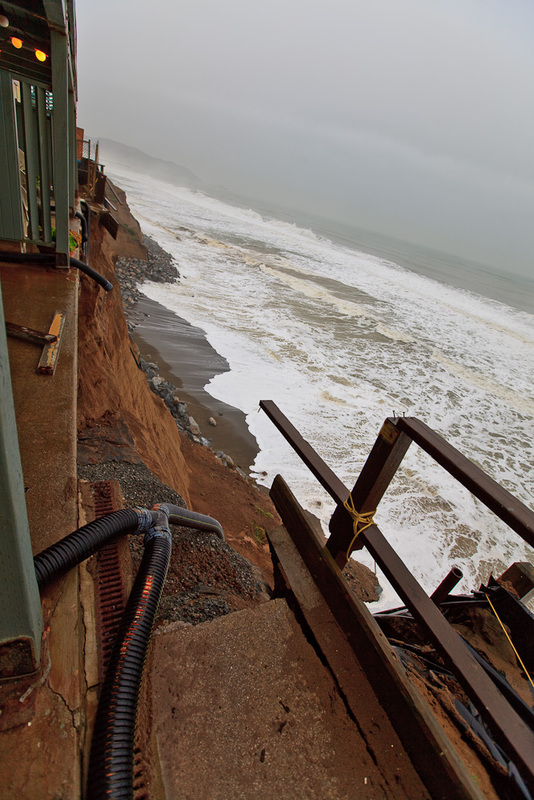 The project may conclude with a sea-wall of some sort at the base of the bluff. 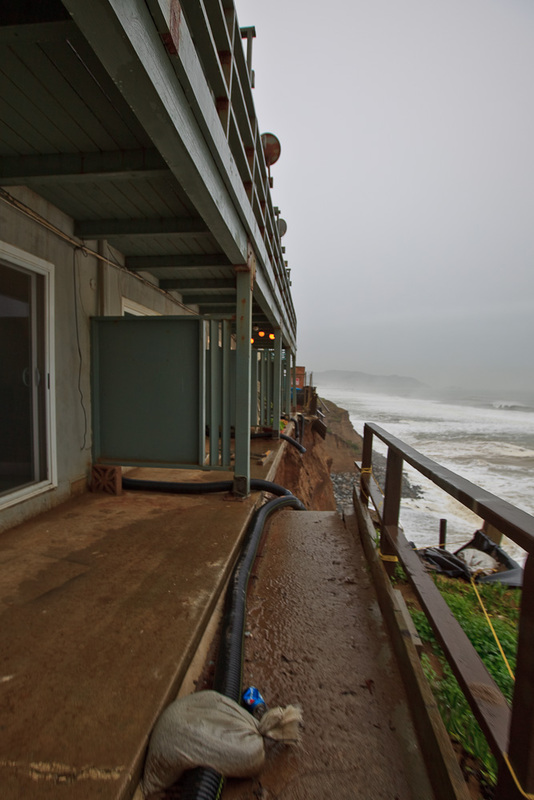 Doug Rider, Pacifica’s Chief Building Official, had been reported to say that his office would not automatically allow people to return to 330 Esplanade. His criteria for evaluating the building were not spelled out but apparently included occupant safety, earthquake security, and groundwater management. Residents I spoke with said that the prospect of a 60 foot vertical drop beneath their back patio or deck would seem unsafe. However, residents of San Francisco high-rise condos seem to like it. Until now the owners of the buildings along Esplanade Ave have paid for all of the work that’s being done to save their property. The rock rip rap wall that was laid at the base of the cliff behind 330 Esplanade shortly after the initial bluff collapse on December 27th was estimated to have cost $200K to $400K. This rock was later extended to provide urgently needed protection for 320 and 310 Esplanade. The projected cost of the work on the bluff below 330 Esplanade has been estimated between $2 and $4 million. 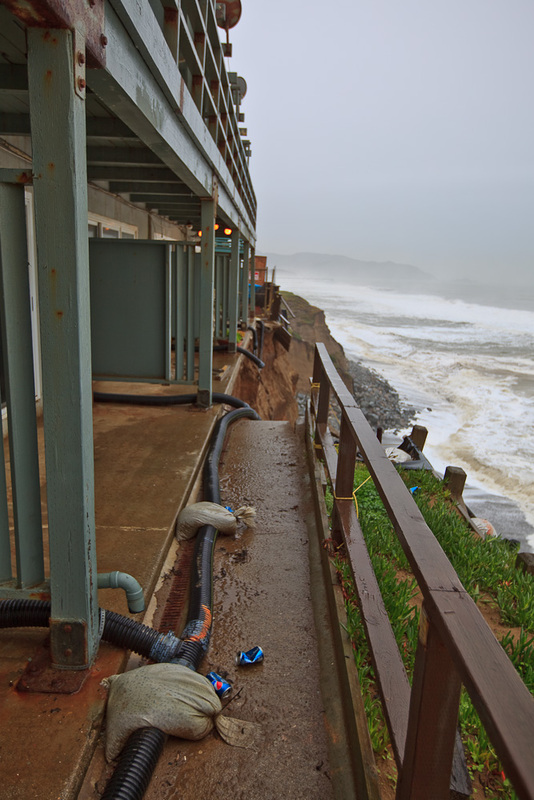 Owners approached Pacifica for help and were rejected: nothing from the City except for critical infrastructure, not for private property. 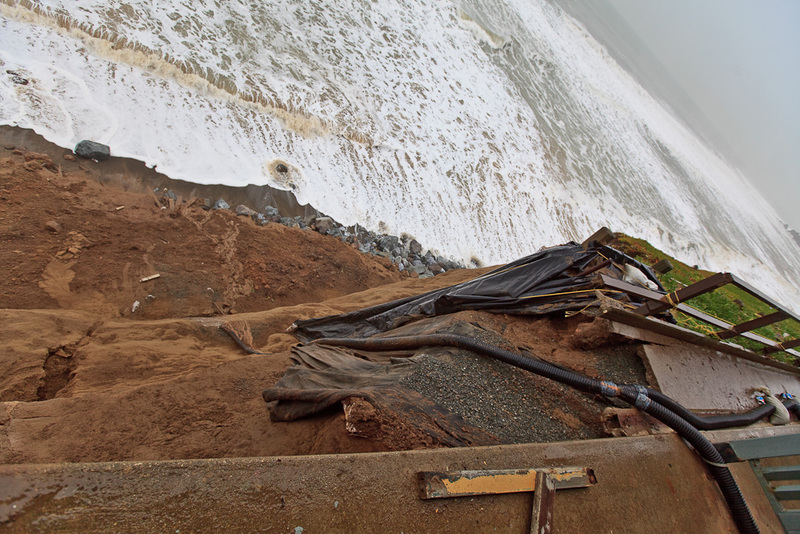 FEMA also rejected their request: a long-eroding coastal area is a pre-existing condition, not an emergency. The county and state have not rejected a request outright, but the current fiscal crisis makes it seem unlikely they have money to spare. The latest idea: get Federal stimulus money. 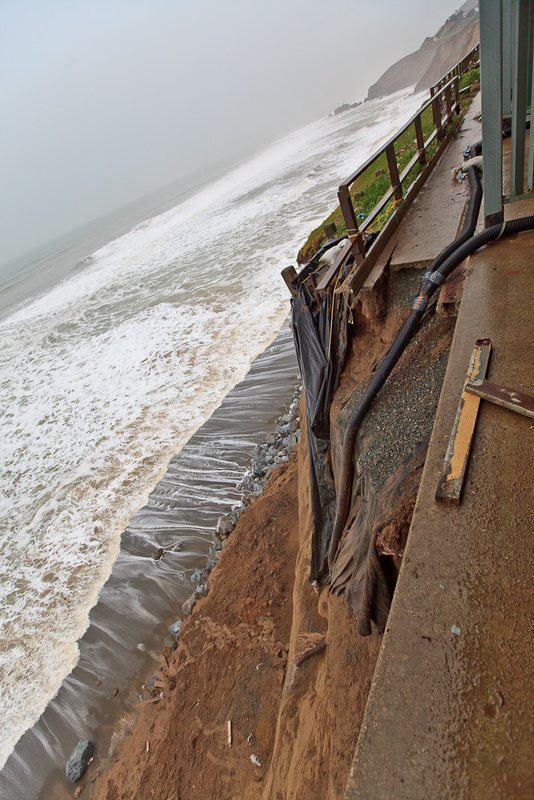 I have heard it reported that the earliest the coastal commission can vote to decide if it will grant needed permits is March, but I don’t have a reference for that just now. Note that back on December 19th and 21st I reported that 330 Esplanade would have been evacuated before crane operations could commence, even if the building had been otherwise safe. If the crane should fail or fall for some reason, it would cut the building in two. This happened in Santa Rosa back on November 18th, 2009: ABC (KGO 7) report 50-ton crane slams into Santa Rosa home. 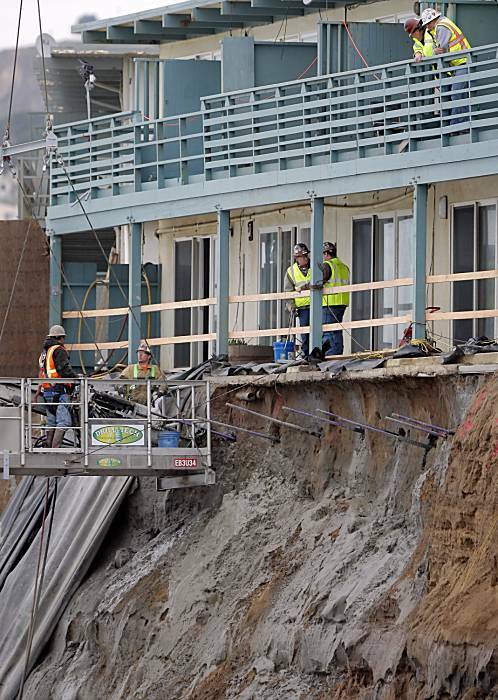 A $1 million fine for modifications to the coastal area without permission was mentioned in the KRON-TV 4 piece New Concerns Emerge About Cliff Behind Pacifica Apartments on Feb 1, 2010. (Note that links to stories on KRON.COM rapidly go bad. Some problem with their site…too bad.) I have not heard any more about this. 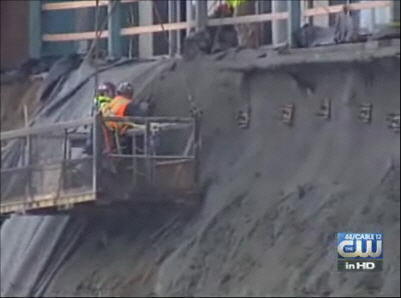 KRON-TV 4 (Independent) reports an additional small fall (2 feet – but how long?) 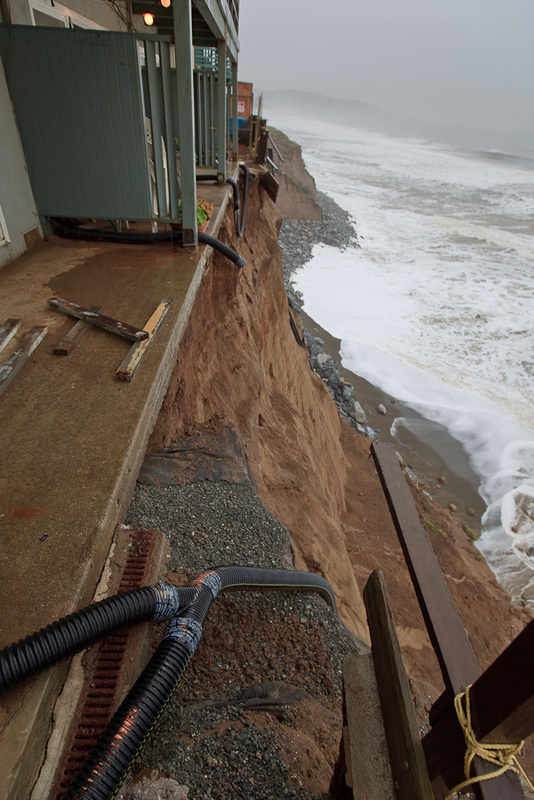 behind 320 Esplanade yesterday or last night: New Concerns Emerge About Cliff Behind Pacifica Apartments. No direct link to the piece available. No news of any decision from Millard Tong, the owner of 320 Esplanade, to commence work to shore up his building. 320 Esplanade imperiled. 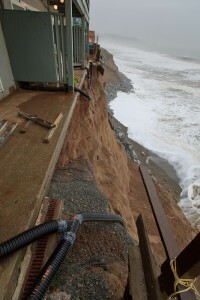 On Thursday the cement walkway, safety railing and bluff behind 3 apartments in 320 Esplanade collapsed into the surf. 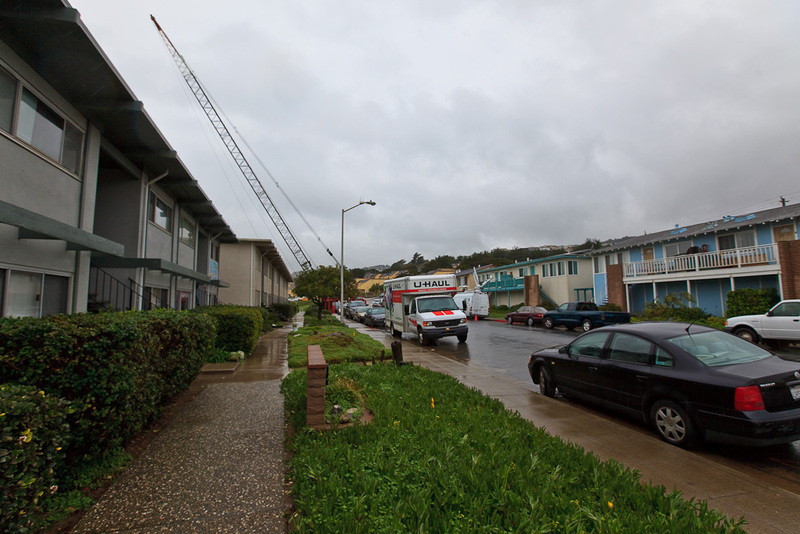 Pacifica’s Doug Rider, Chief Building Official, “red tags” the building as unsafe and residents are evicted… from just the affected apartments. 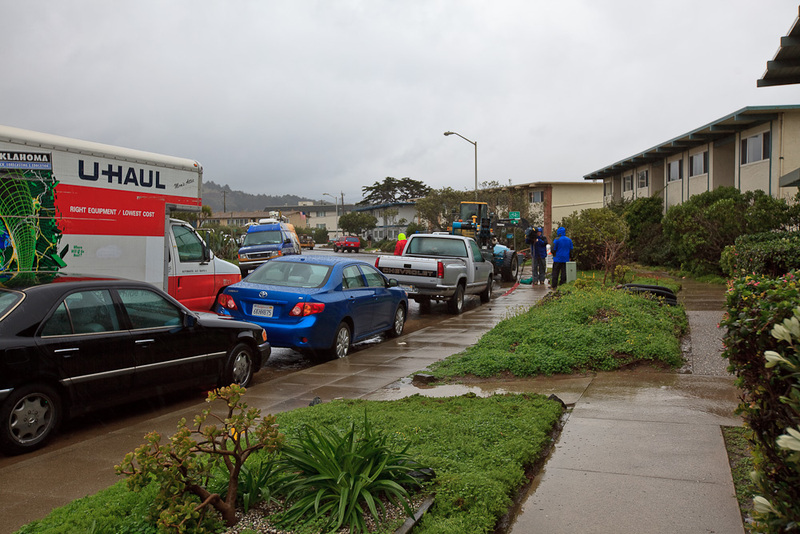 (A total of 6 units were vacated: 3 on the first floor, and 3 on the second floor). We move out, but don’t go far. Enough’s enough. Enough of losing the safety margin behind the apartment and enough of early morning pounding on the door. See the scary pictures and our personal time-line. Owners decided to save 330 Esplanade. 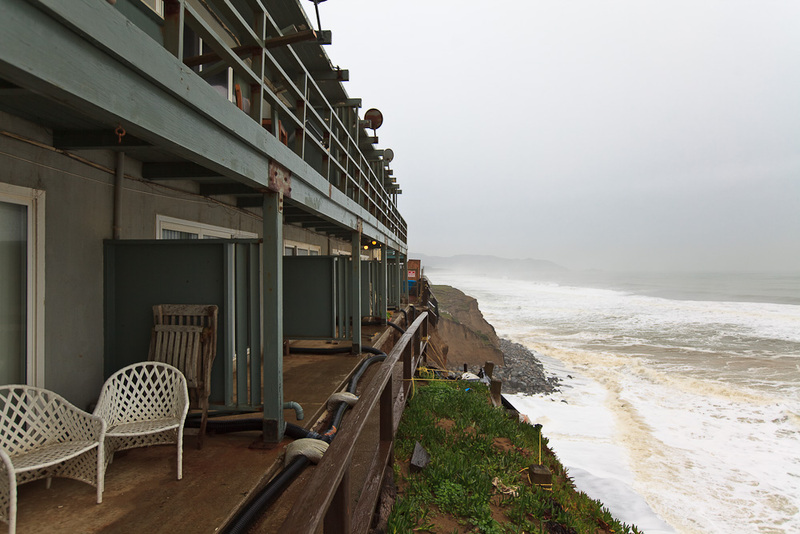 On Sunday the San Francisco Chronicle’s website SFGate reported that the owners decided to ante up the > $1 million needed stabilize the full height of the bluff, Spectators riveted as Pacifica buildings teeter. Questions remain about whether the owner of 330 Esplanade will sign on for similar work behind his building, and whether he can without forcing the evacuation of the remaining residents. 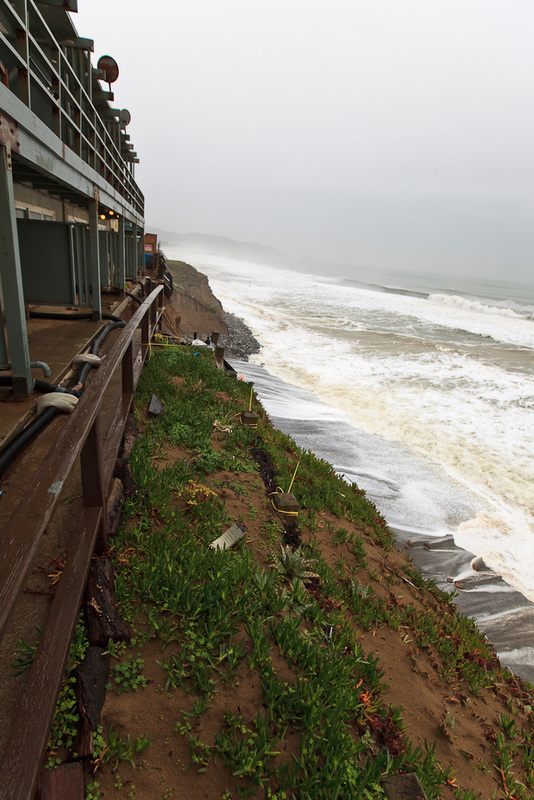 Storms continue, but without the 20+ foot surf that threatened the bluff.